Helical piers are an environmentally friendly alternative to traditional pile driving. Engineered Foundation Technologies utilizes helical piers made of recycled steel. In unto themselves, helical piers are an eco-friendly construction method. The piles provide structural support over poor soil conditions. 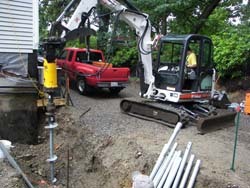 Helical piles produce little to no vibrations during installation and do not generate much disturbance to the area. This is extremely advantageous when working in heavily populated areas where traditional pile driving would create a disturbance. Contractors can earn LEED credits for using helical piers, providing projects with an environmentally friendly foundation support system.